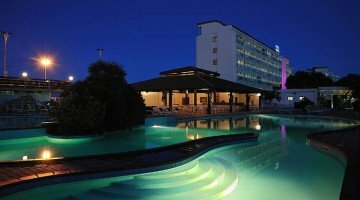 The 4-star Hotel Adria , open all year round in Milano Marittima, offers private beaches, swimming pools with Jacuzzi and two tennis courts. It offers services for people with disabilities and cooking for celiacs. Small pets allowed. The hotel is located in Milano Marittima, a few steps from the beach and a five minute walk from the centuries-old pine grove. STANDARD : equipped with balcony with sea view or pine grove view, air conditioning, safe, satellite TV, telephone, minibar, safe, bathroom with shower and complimentary toiletries, hairdryer and magnifying mirror. COMFORT : they offer the same services of the "standard" type in more spacious and renovated rooms, with free WI-FI. Two private beaches with exclusive access, two tennis courts, garden, three swimming pools with solarium and jacuzzi, open-air porch, gym, heating, satellite TV, elevator, reading room, conference rooms, beach towel, entertainment with theme nights. The structure is equipped for the stay of cyclists. PARKING : uncovered and free for all guests. AIR CONDITIONING : available in the room and in the common areas. CONVENTIONS : private beaches, amusement parks, discos, gym, swimming pool, possibility of organized excursions. SERVICES FOR DISABLED : entrance and common areas accessible, elevator up to standard, rooms with wheelchair maneuvering space, bathroom with shower accessible. BREAKFAST : international with homemade desserts. LUNCH AND DINNER : every day chosen from four menus based on meat and fish accompanied by buffet of dishes inspired by local tradition. Lunch buffet served by the pool. Attention in the choice of raw materials, drinks always included in the price of the all-inclusive formula. In the hotel : children's pool, baby sitter (for a fee), entertainment. On the beach : entertainment, games and inflatables. 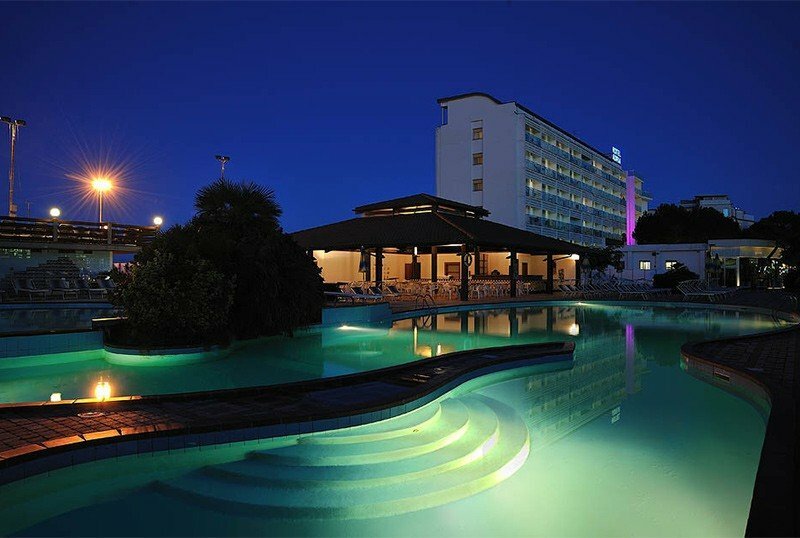 Hotel Adria has three swimming pools: one of 400 sqm with depths from 0.80 to 2.20 meters, surrounded by a solarium area equipped and served by the bar and the restaurant; the second, dedicated to children with a slide; the third, located at the back of the building on the sea side, with hydromassage jets. The structure has two modular rooms with the possibility of hosting up to 200 people for meetings and meetings. The hotel has two private beaches, Bagni Deanna and Gabbiano, reachable with exclusive entrance. Hot showers, parking, table tennis, TV, bocce courts, entertainment.